If you love the all white look but are afraid it’s a little cold, natural wood tones are an excellent way to warm up your space. The white and wood look has gotten more popular with the resurgence of rustic design elements like exposed beams and hand scraped wood floors. To achieve this look without renovations, use window treatments like Wood Blinds and Drapery to pull together your white and wood design. Great for bathroom window treatments, kitchens, and just about any room in the home, Wood Blinds offer an easy opportunity to add warmth and color to an otherwise white space. The Shade Store carries 7 styles of Wood Blinds, so you have a variety of choices when it comes to choosing color. Our 2” Basic Wood Blinds in Oak, Tiger Eye, or Cherry Wood would look gorgeous with a white color palette. 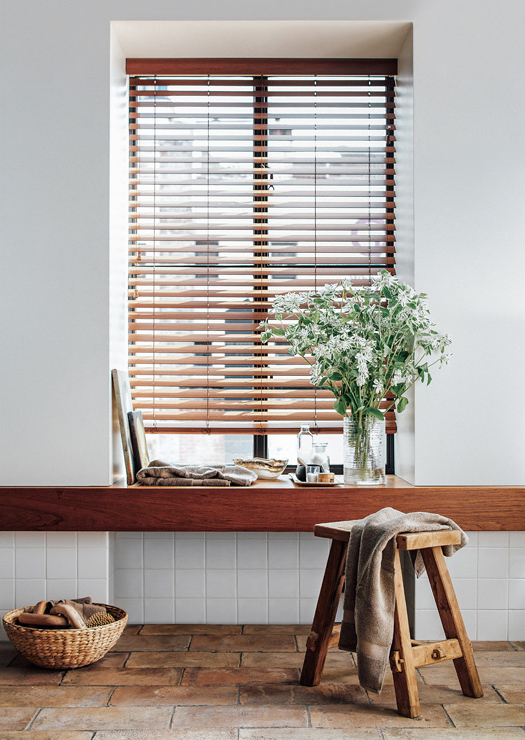 Even our Faux Wood Blinds, shown in Teak in the photo above, give the illusion of real wood while providing extra durability and moisture resistance for damp areas like bathrooms and laundry rooms; plus, they contrast very nicely with white subway tile. Tailored Pleat Drapes. Design by M&P Design Group. An easy solution to add a little wood and white to your room at once is to choose white Drapery paired with wood hardware. 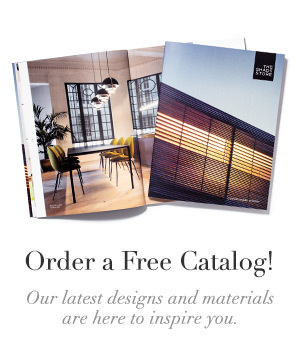 Out of our 16 exclusive hardware collections, we offer four solid wood pole rod and ring options (Essex, Royal Wood, Lenox, and Bowery) and one track system with a wood-look finish (Tribeca). Pair any of these with white Drapery for an effortlessly stylish white and wood look. In the dining room shown above, M&P Design Group played off of the wood table, white chairs, wood beams, and white ceilings when they chose the Tailored Pleat Drapery for the large windows. In modern designs, drapery serves the dual purpose of softening the straight lines of contemporary designs while also treating windows with privacy, light blockage, and draft blockage. Simple floor to ceiling drapes in Suede add rich texture to this otherwise sleek living room by Anita Lisek. The white and neutral palette is broken up by the beams and wood floor, whose tones are echoed in several pieces of art and the throw pillows. It’s easy to balance white and wood decor using window treatments like blinds and drapery. 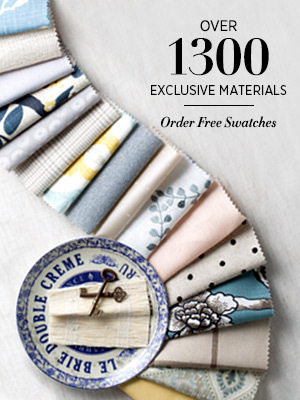 Order free swatches of our Drapery and Wood Blind materials to find the perfect harmony in your home. 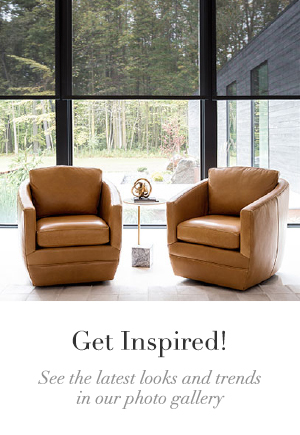 If you have a vision for your space or are particularly inspired by a certain image, bring it into one of our showrooms and our expert Design Consultants will help make your design goals a reality.